Each year, a group of Ermitage Upper School students venture to rural India to contribute to the community in a positive way and be transformed in the process. This trip is part of a 2-week service learning and exchange program in partnership with fellow Round Square schools the Daly College of Indore and the Dhirubhai Ambani International School of Mumbai. Hosted by the Daly College during the first week, 23 Ermitage students focused their efforts on women's empowerment and access to education. The 2015 projects included the construction of waterclosets at small village schools. Given the conservative nature of the Indian culture, many young girls actually drop out of school without proper access to toilet facilities. This basic necessity has an important impact on girls' access to education. Ermitage students enthusiastically constructed waterclosets at two different community schools, collaborating to efficiently prepare the grounds and produce the final structures. While on the project sites, Ermitage students also had the opportunity to interact with children from the local village in their classrooms, transcending cultural boundaries and sharing heartfelt experiences from dancing to language lessons. A particularly touching moment was when Ermitage students were invited to participate in a local wedding ceremony, where a very antimated and international dance party ensued. Students also explored a women's opportunity center which is dedicated to providing women unique education opportunities as well as sustainable farming practices to bring back to their communities. Similarly, students interacted with women from another empowerment program, where women are able to earn a fulfilling and dignified income through handloom weaving. Both organizations aim to aliviate poverty in unique, sustainable ways. During the second week, Ermitage students experienced family life in Mumbai, where they were hosted by families of the Ambani School. Their enriching program included a variety of tourism and humanitarian activities, ranging from teaching French to conducting eye exams. 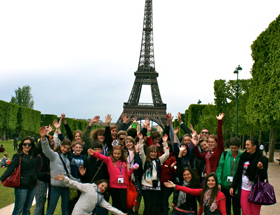 Ermitage later welcomed their host students for a visit to France, where they explored Paris and its surrounding communities. Upon returning from their experience, students have helped the project live on throughout a variety of presentations and events, including the Benefit Presentations in May 2015 to raise funds for relief efforts in Nepal.